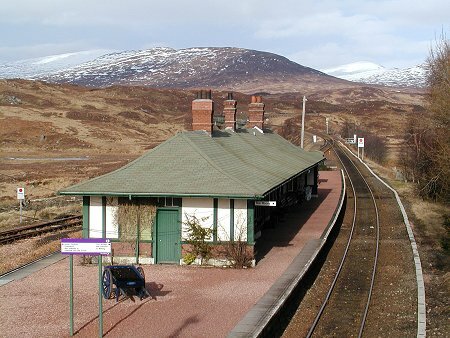 Rannoch Station's chief attraction is that it is a long way from anywhere else: and locating it is easier than reaching it. 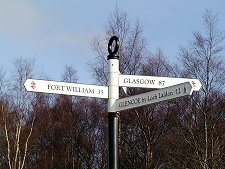 Directions are simple: catch the train from Glasgow or Fort William. Or take the A9 to Pitlochry, then head west along the "B" roads that run for the better part of 40 miles along the north side of Loch Tummel and Loch Rannoch and past Kinloch Rannoch. At the end of the road, literally, you find a magical plateau at a height of a thousand feet, surrounded by distant mountains. 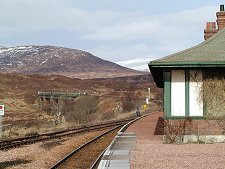 And you find the reason for the existence of Rannoch Station at a lonely outpost on the West Highland Railway. At this well manicured station a handful of trains each day stop to drop off or pick up passengers en-route to either destination. There is really nowhere to compare with Rannoch Moor, which extends south and west from Rannoch Station. 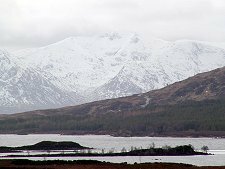 It is a peaty, lonely plateau full of lochs and lochans whose extent is difficult to comprehend. Standing alone on Rannoch Station platform, or better still on the bridge over the track, you start to gain a sense of the way much more of Scotland used to be. Look back towards Pitlochry and the most striking feature is the pointy outline of Schiehallion, the Fairy Hill of the Caledonians. To the distant west are the mountains of Glen Coe and the Black Mount, on the further side of the moor. South-east is the northern side of the Glen Lyon Hills. 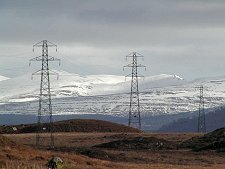 North-west, past Rannoch Forest, is the equally treeless and still more lonely Ben Alder Forest. It's a wide-open landscape, and a beautiful if slightly desolate one. For the outdoor enthusiast there is trout fishing on Loch Laidon and wildlife to view, as well as rambling and hillwalking. For the more sedentary, a trip on the West Highland line gives the opportunity to relax and enjoy the views go by, all the way to Mallaig on the West coast, connections permitting. And if you reach the end of this road between March and October, you'll find a welcome at the Rannoch Station Tea Room and Shop. Situated in the main station building and serving a tasty menu of homemade soups, cakes and snacks, visitors can also stock up on local books, maps, walker's provisions and gift items here. Rannoch Station also boasts visitor accommodation in the form of The Moor of Rannoch Hotel, a remarkable oasis in the midst of such an expanse of wilderness. Here both residents and non-residents are welcome to drink and to dine. 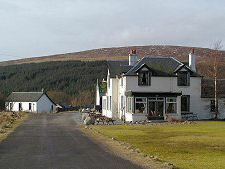 The hotel was built to house the civil engineers working on the building of the West Highland line which began in 1889. Covering a distance of 101 miles from the Firth of Clyde to Fort William this is the longest stretch of railway ever to be constructed at one time. It was also one of the most difficult. It took 5,000 men five years to build, and the line was built on top of a floating causeway of brushwood over Rannoch Moor. The stations along the line, including that at Rannoch, were designed by the architect James Miller.